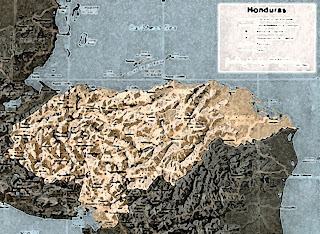 Ball State University Libraries GIS Research and Map Collection contains numerous maps of Honduras and Central America. And researchers and scholars can also discover information about the history of Central America from atlases in the University Libraries. Mapa General, Republica de Honduras is a unique map of Honduras showing the country’s roads and topography. The map includes an inset map of Tegucigalpa. Honduras: Central America Tourist Map includes a distance chart, traffic signs, historical sites, gas stations, recreation areas, and agriculture. Inset maps detail the cities of Tegucigalpa, La Ceiba, and San Pedro Sula. This text of this map is in English and Spanish. The GRMC also includes several updated report maps of Honduras from the Central Intelligence Agency. Another unique map in the collection is Mapa Forestal (forest map) of Honduras and its neighboring countries of Guatemala and Nicaragua as well as Panama. Tegucigalpa D.C. y Vecindad is a map of the capital city and its neighborhoods. And Bahia de Honduras is a rare map from 1938 showing railroads, main highways, and bridle paths. A similar map in the collection was produced in 1921. Historical Atlas of Central America and Historical Atlas of Ancient America are available from the Atlas Collection on the second floor of Bracken Library and provide information about the history of Honduras and its neighbors. Atlas of Central America and the Caribbean and Climatic Atlas of North and Central America are also available for research. Maps from the GRMC circulate for two weeks or longer. Atlases circulate for 28 days or longer. Please contact the staff of the GRMC at 765/285-1097 for more information.